In our last blog, we covered some tips on how you can improve your outdoor lighting for both function and ambiance. In this post, we thought we’d look at some indoor lighting tips and how you can make each room feel more comfortable and function the way you want it to. As your lighting store in Grapevine, Passion is here to help you find the best options for every need, no matter if you’re remodeling your house or you simply need a new living room lamp! We’ve talked about moving room by room through your house before, and when it comes to indoor lighting, that can often be the best approach to take. In the dining room, you want the table to be the focal point. This means making it the brightest spot in the room, often by hanging a chandelier or a large pendant fixture above it. If you have a buffet or china cabinet, highlight it with indirect light that’s provided by wall sconces. The bedroom is supposed to be cozy and intimate. Bright, harsh light has no place here, and it’s best to go with bedside lamps that provide soft light, and with the the ceiling fixture, make sure the light is diffused and spread throughout the room. If you love to cook, then you spend a lot of time in the kitchen. Task lighting is essential, and that can be achieved with direct light from pendants and under cabinet fixtures. Overhead lighting can come from recessed fixtures or one general fixture that can be brightened or dimmed with a switch. The living room is where you relax and entertain. It’s important to avoid dark corners, and adding indirect light that washes one wall can make the space more appealing. By combining overhead lighting with table lamps, floor lamps, and track lighting, you can create a truly unique living room. Much like the kitchen, task lighting is key in the bathroom. You’ll want light near the mirror and above the shower or tub, but you should also include a dimmer switch so that you can set the levels where you want them. 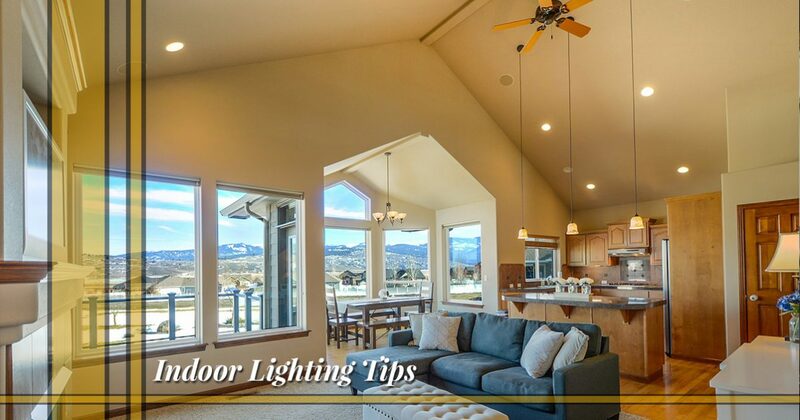 These are just a few of the tips that can help you improve your indoor lighting design. If you’re shopping for new fixtures or you need advice on how best to use your lighting, visit Passion in Grapevine today.